48 hours free travel on public transport: Barcelona metro and city buses run by Transports Metropolitans de Barcelona, and Ferrocarrils de la Generalitat de Catalunya city and suburban trains, trams, Barcelona airport train and Renfe suburban trains zone 1. Collection points: at any Tourist Information Office, from 8.30am. to 8.30pm. Pl. Catalunya: plaça de Catalunya, 17-basement. Pl. Sant Jaume: Ciutat, 2 (open daily: Monday to Friday: 8.30am-8.30pm Saturday: 9am to 19pm. Sunday and holiday days: 9am to 14pm). Airport. Terminals T1 and T2: Aeroport de Barcelona. Plaça Espanya: plaça Espanya, s/n - Avinguda Maria Cristina (open daily 9am to 3pm. July-September, daily from 8.30am to 7.30pm). Sagrada Familia: plaça de la Sagrada Família (open daily 9am to 3pm. July-September , daily from 8.30am to 7.30pm). 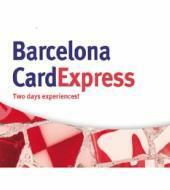 Card valid for 48 hours!